There's a cool new game at WinADay Casino this week. Stardust is a space-themed game with a modest betting range but great payouts, especially in its bonus round. With it's relatively low bets ($.30 - $6 per spin) Stardust gives lots of fun for pennies a spin. However, since its bonus round awards prizes up to 5000 coins, payouts can be out of this world. 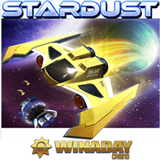 Stardust features a Double Wild bonus and a Pick Me bonus game. The Double Wild symbol doubles the win on any winning combination it’s part of. When three or more Pink Crystals appear players pick one to reveal an up to 500X win multiplier. “This game seems pretty loose to me – I had no trouble winning enough to keep me playing quite awhile,” remarked another player. The Stardust video slot is always played with 15 paylines. Bets are in Coins. To spin, you click on one of the large buttons for five possible bets, 30, 60, 120, 240 or a max bet of 600 coins. You can see your Account Balance and Total Bet in Coins or Dollars.